What’s happening with the president of Venezuela? Well, that’s kind of a long story. Nicolàs Maduro has been the president of Venezuela for more than five years. Maduro served as vice president under Hugo Chavez and filled the position after his death in 2013. He went on to win the presidential election that same year and has been in power ever since. Since Maduro became president, Venezuela has been falling apart. Despite having the largest proven oil reserves in the world, the country’s economy is in crisis. Inflation is through the roof, and the prices of goods have skyrocketed with it, including essentials like food and medicine. This scarcity sparked protests beginning in 2017, which were met with violence from Maduro’s government. At least 125 people died, and the impacts are still being felt today. In addition, Maduro has been using some pretty shady political practices to consolidate his power. After the opposition won a majority in the National Assembly, Maduro instead spearheaded the creation of the new Constituent Assembly filled only with his supporters to rewrite the country’s constitution. One of the new legislature’s first acts? Stripping all powers from the National Assembly. Maduro has also packed the Supreme Court with his supporters. That all sounds pretty bad. So, what’s happening now? Maduro technically won reelection back in May and was sworn in as president earlier this month. However, voter turnout was remarkably low with less than half of the population participating in the election. This was a result of the opposition party calling for citizens to boycott the election, which they believe was rigged in favor of Maduro. In addition, political opponents were jailed or barred from running against him. Maduro’s main opponent, Henri Falcón, refused to recognize the results of the election. Multiple countries, including the United States, also dismissed the results. The White House released an official statement last Wednesday, condemning Maduro and recognizing Juan Guiaidó, who is currently the president of the National Assembly, as the interim president. According to the constitution of Venezuela, there should be another election in the case of the absence of the president. While that’s happening, the president of the National Assembly is the interim president. If you consider the most recent presidential election illegitimate, the office has been empty ever since Maduro’s term expired on January 10, 2019. Thus, Guiaidó is the real person in charge. Complicated, right? The conflict has garnered global attention, and countries have taken sides. Maduro’s biggest supporters are China and Russia, while Guiaidó is backed by the United States, the United Kingdom and Canada. The European Union hasn’t taken a stance yet. 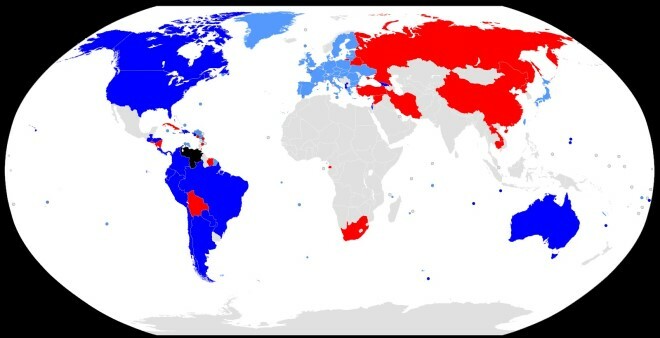 Dark blue countries recognize Guiaidó, light blue countries support the National Assembly and red countries recognize Maduro. Photo courtesy of Creative Commons. Why does the U.S. even care? The United States actually has a pretty long history of intervention in the region. It could be a desire to defend Venezuelan democracy. It could also be because of Venezuela’s oil wealth or the fact that Maduro is supported by Russia and China. Whatever the case, the United States has taken a pretty strong stance. Hard to say. On Monday, the United States placed strict sanctions on Venezuela’s state-owned oil company, PDVSA. The U.S. is one of Venezuela’s biggest oil importers, but American oil refineries are being told not to give the country money for crude oil. Instead, the money is being placed into frozen accounts in the U.S. The hope is that the blow to the economy will help push Maduro out. Once that happens, Venezuela will get the money. In response, Maduro ordered that all American diplomats to leave the country. The United States fired back by saying if any action is taken against U.S. staff in Venezuela, they will respond in kind. With more and more countries “picking a side” every day, it is unclear who will come out on top or how difficult the conflict may be for the people of Venezuela. Too afraid to ask: Why are people talking about Brexit again?